Read the interview with Thomas Lynch about the RO DBT books in the Gürze/Salucore Eating Disorders Resource Catalogue. 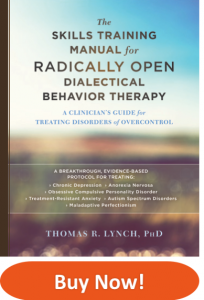 Based on over twenty years of research, radically open dialectical behavior therapy (RO-DBT) is a breakthrough, transdiagnostic approach for helping people who suffer from extremely difficult-to-treat emotional overcontrol (OC) disorders, such as anorexia nervosa, treatment-resistant depression, and obsessive-compulsive personality disorder (OCPD). While traditional dialectical behavioral therapy (DBT) has been developed to treat people with emotion dysregulation, there have been few resources available for treating those with overcontrol disorders. OC has been linked to social isolation, aloof and distant relationships, cognitive rigidity, risk aversion, a strong need for structure, inhibited emotional expression, and hyper-perfectionism. And yet—perhaps due to the high value our society places on the capacity to delay gratification and inhibit public displays of destructive emotions and impulses—problems linked with OC have received little attention or been misunderstood. Indeed, people with OC are often considered highly successful by others, even as they suffer silently and alone. RO-DBT is based on the premise that psychological well-being involves the confluence of three factors: receptivity, flexibility, and social-connectedness. RO-DBT addresses each of these important factors, and is the first treatment in the world to prioritize social-signaling as the primary mechanism of change based on a transdiagnostic, neuroregulatory model linking the communicative function of human emotions to the establishment of social connectedness and well-being. As such, RO-DBT is an invaluable resource for treating an array of disorders that center around overcontrol and a lack of social connectedness—such as anorexia nervosa, chronic depression, treatment-resistant anxiety disorders, autism spectrum disorders, as well as personality disorders such as avoidant, dependent, obsessive-compulsive, and paranoid personality disorder. 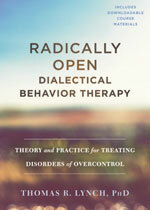 Written for mental health professionals, professors, or simply those interested in behavioral health, this seminal book—along with its companion, Radically-Open Dialectical Behavior Therapy Skills Training Manual (available separately)—provides everything you need to understand and implement this exciting new treatment in individual therapy—including theory, history, research, ongoing studies, clinical examples, and future directions. A new and comprehensive statement from one of the more creative minds in evidence-based clinical intervention today, Radically Open DBT brings together a contemporary focus on a limited set of key transdiagnostic processes, with new assessment and interventions techniques for moving them in a positive direction. Emphasizing flexibility, openness, connection, and attention to social signaling, RO DBT specifies the details that can matter, from how you arrange your consulting room furniture to how non-verbal cues signal social information. RO DBT seems destined to make an impact on evidence-based care in many corners of clinical work. Thomas R. Lynch, PhD, is Professor Emeritus of Clinical Psychology at the University of Southampton. He was formerly Director of the Duke Cognitive Behavioral Research and Treatment Program at Duke University, Professor at Exeter University, and Director of the Emotion and Personality Bio-behavioral Laboratory at the University of Southampton. 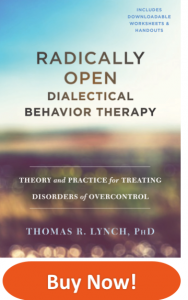 Professor Lynch is the treatment developer of Radically Open-Dialectical Behaviour Therapy (RO-DBT)—a new transdiagnostic treatment approach informed by 20 years of clinical research. Dr. Lynch’s primary research interests are understanding and developing novel treatments for mood and personality disorders using a translational line of inquiry that combines basic neurobiobehavioral science with the most recent technological advances in intervention research. 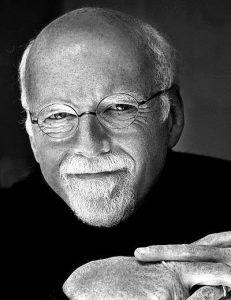 He is the founder of radically open dialectical behavior therapy (RO DBT). Dr. Lynch has received numerous awards and special recognitions from organizations such as the National Institutes of Health-US (NIMH, NIDA), Medical Research Council-UK (MRC-EME), and the National Alliance for Research on Schizophrenia and Depression (NARSAD). His research has been recognized in the Science and Advances Section of the National Institute of Health Congressional Justification Report; and he is a recipient of the John M. Rhoades Psychotherapy Research Endowment and a Beck Institute Scholar. Watch Tom’s response when he holds the RO DBT Skills Manual in his hands for the very first time!